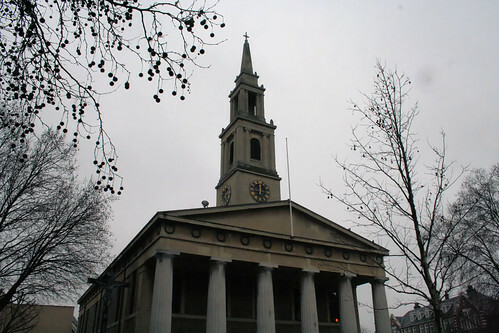 In response to the spiritual needs of a growing population, in 1818 the Parliament voted funds for the building of a series of new churches in cities, and one such church is the Neoclassical Doric pile just outside Waterloo Station. St John’s Waterloo is the largest of later became known as the Waterloo Churches and is significantly grander, largely due to its proximity to the South Bank which gave it a public prominence that other churches on smaller streets lacked. Built in 1823–24, and consecrated by the Bishop of Winchester on 3rd November, 1824, the church was badly damaged in 1940 by a direct hit from a German bomb, and later restored for the Festival of Britain in 1951. It may be difficult to believe it, considering the dominance of concrete and stone in the area, but Waterloo is actually quite marshy, and in order to build a large church on the site, a huge number of oak beams were driven into the ground to form the foundations, upon which was built a brick vaulted crypt and the Doric inspired church above. 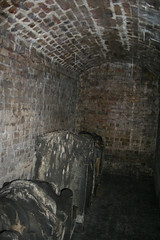 Today, the church was offering guided tours of this “secret crypt” as part of a general community open day. Although the crypt was originally used for the burial of the rich who wanted to be as close as possible to the alter on Judgement Day, most of it was cleared out during the post-war restoration, and an entrance into the newly cleared space built next to the church. However, the cleared area only covered the space under the Church itself – and the crypt actually extends under the front of the building towards the public pavement, and this untouched “secret crypt” was the highlight of the tour. A side entrance inside the church takes you down roughly two stories to the main entrance for the other users, and through a small door into a very grand, yet still crypt like area, which is evidently used for storage space. 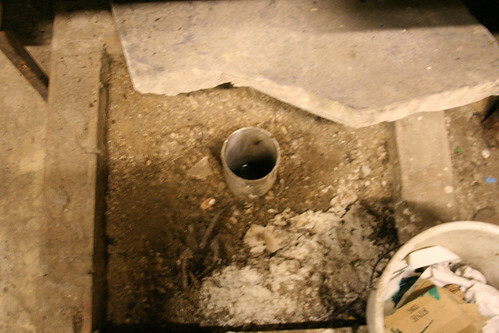 Here we were also shown a pipe in the floor with water a few inches below the stone flooring. That is the water table level – and during the construction of the Jubilee Line nearby, they had to monitor this everyday to ensure the water level didn’t drop. Remember that the church is built on oak piles in a marshy soil? Well, if those piles ever dried out, then the foundations would probably not support the church, and you would come into work one day to find the church had converted overnight into a pile of masonry. In fact, the water level did drop once during construction – causing a major panic, visits by lots of Jubilee Line surveyors and eventually, pumping of millions of gallons of water back into the ground to stabilize the foundations. Up another couple of steps – made out of wobbly wooden planks and we were into a long narrow corridor that runs the entire width of the church – and lacked any lighting. Had I known, I’d have brought a torch, but we were guided by one wind-up torch, a few glowing mobile phone screens, and the occasional flashes from my camera. Lining the corridor, like many crypts I have been in are arched “rooms” many of which had been sealed up with nameplates, but a couple were still open to show their size. At the far end of the corridor we were able to glimpse the slide where coffins would be lowered into the crypt from outside the church – the remains of the entrance being just visible from the outside. Unlike some of the dedicated cemeteries built later, there is no special lift in the church to dramatically lower the coffin to the underworld – just a slope to slide them down. 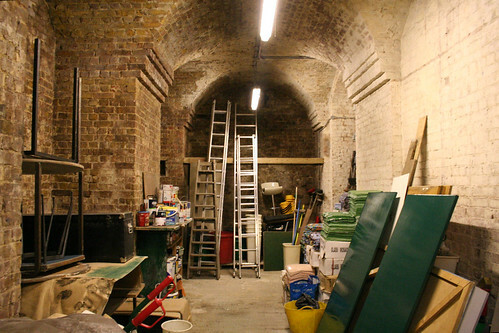 As mentioned above, the rest of the crypt was cleared in the 1950s restoration, and after a while serving the needs of the “cardboard city” that slept in the Waterloo underpass, it is now used by a series of local arts and community services. There are plans to expand the crypt area in the future to take into account the needs of the community groups that now use the space. 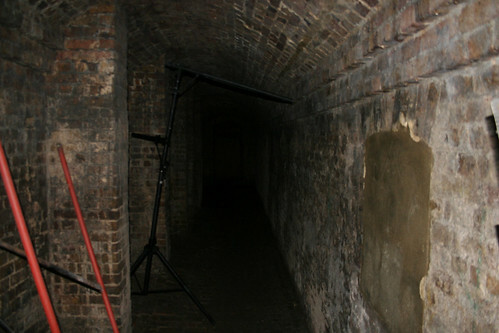 1 Pings/Trackbacks for "The “secret crypt” under St John’s Church in Waterloo"